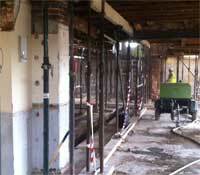 Small Works Construction are an established construction company who have been offering their services since 1996. Initially undertaking tiling for projects in the leisure industry, we then formed relationships with many national contractors working on high profile projects throughout the UK. This staircase has been custom built and tiled by South West Ceramics if you require some thing similar please contact us. We can assit or manage building works up to the value of £1,000,000 contact us to get a quote.